Comments: ALTERNATE EDITION: Instructor's Edition. New and in great condition with no missing or damaged pages. Need it urgently? Upgrade to Expedited. In stock and we ship daily on weekdays & Saturdays. Nexos Media Edition offers total flexibility for a variety of course settings. Whether your course is a traditional classroom course, a hybrid course (combination of classroom and online instruction), or taught completely online, Nexos Media Edition offers solutions via a unique combination of print and digital components. These carefully integrated resources can be combined in any way to address individual course needs. The print components include a paperback text and supporting Student Activities Manual (SAM). The digital components include a robust interactive multimedia eBook and eSAM (housed in either Eduspace or Blackboard/WebCT) that provide an array of media capabilities. Developed as an integrated program, the print and digital options can be mixed and matched to address individual course needs. 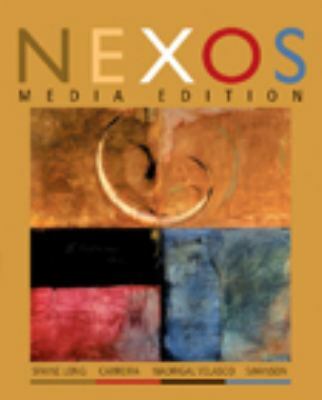 In addition, students may purchase a static, downloadable PDF eBook.Offering seamless integration of the National Standards for Foreign Language Learning, Nexos Media Edition includes all of the features of the print text to prepare introductory Spanish students to communicate meaningfully in interpersonal, interpretive, and presentational modes. Through realistic pacing of material, easy-to-use grammar, practical vocabulary, and a modern video story line that contextualizes grammar and vocabulary, the program provides rich linguistic and cultural content that engages students and promotes language learning. Situations, vocabulary, and activities throughout the text reflect a technologically up-to-date, Internet-proficient Spanish-speaking world that appeals to today's students.Long, Sara is the author of 'Nexos Media Edition ', published 2006 under ISBN 9780618684274 and ISBN 0618684271.